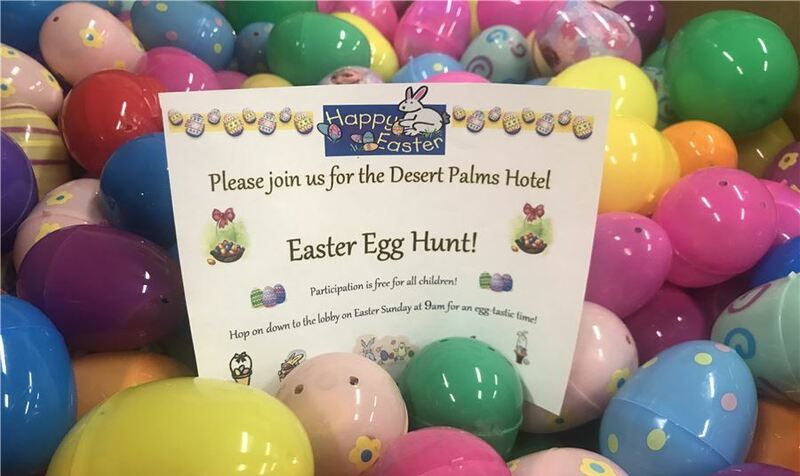 Join us this Sunday for an Easter Egg Hunt in the lobby at the Desert Palms Hotel. Just because you are away from home doesn’t mean your kids don’t get to enjoy their annual egg hunt. Come down the to lobby before 9:00am to get your basket and get ready to collect those eggs! Our hunt is fun for kids of all ages with one area for egg collecting. It will start promptly at 9:00am so don’t be late! But if you do come down afterwards we will have a limited supply of extra eggs at the Front Desk to hand out. Our eggs are plastic with toys and candy inside but if you are looking for real colored eggs we will have them in our breakfast room. Hop on down Easter morning and join us for an egg-tastic time!